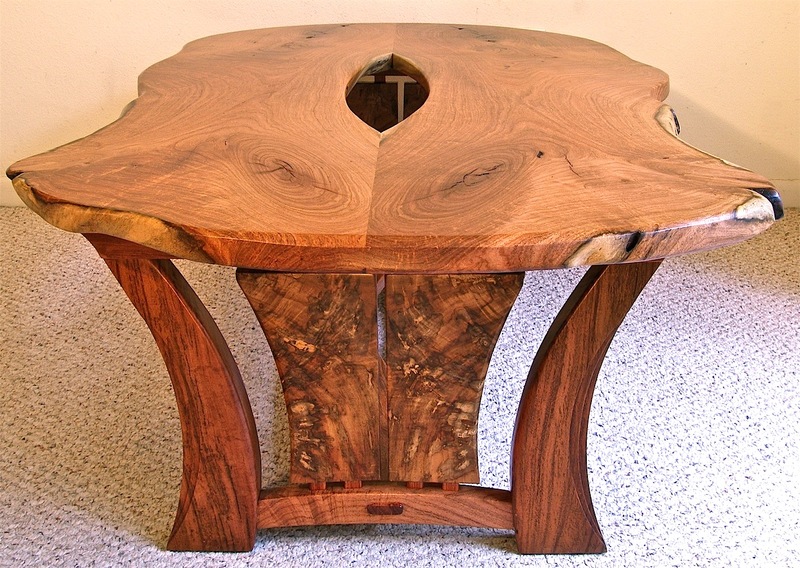 This table is my first completed piece in 2013. It is also my first “live edge” table where I have left much of the undulating, natural edge on the two book-matched slabs that make up the top. For the base, my intention was to create something that complimented the top and yet took the piece beyond the category of being just another live edge table where the sole or primary focus was on the top. One thing I like about this table is that it reveals different things about itself when viewed from different angles and different distances. I hope it has enough interesting visual and tactile elements in it to keep its owners pleased for a long time. I like to imagine a toddler crawling around under this piece and experiencing it as his (her) little hideaway or fort, then pulling himself up on the top to get a better view of the world. This table could probably hold up a small elephant. Hopefully, the opening in the top is too small for a little round head to get itself stuck in. The nicely figured panels suspended in the center of each pedestal are Texas pecan. 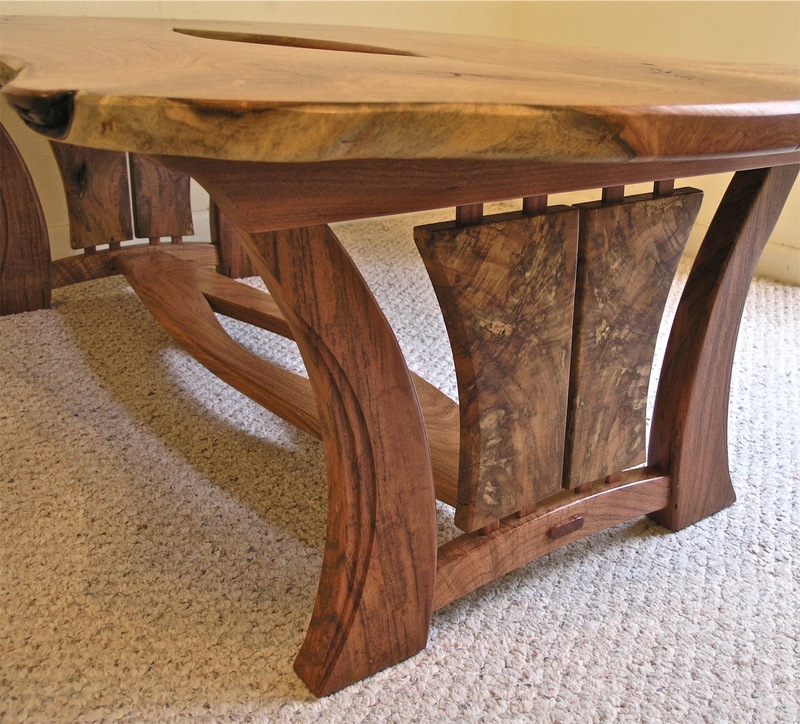 To see more of my work, please visit my Furniture Gallery. Your work is incredible! 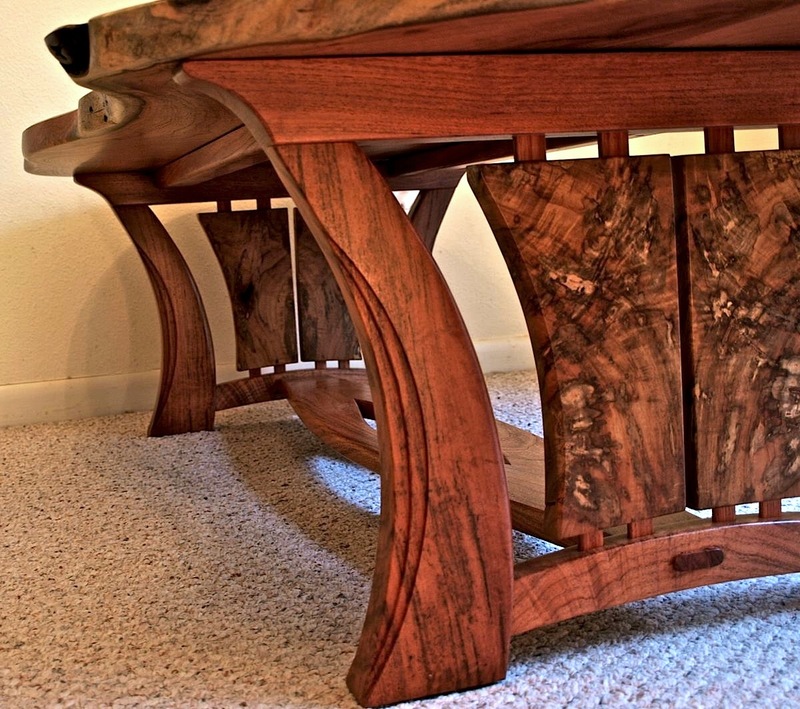 This coffee table is the best I’ve seen – the figuring in that Texas Pecan is awesome. So glad I stumbled across your website and blog. I am up in Ohio and have been dabbling in live edge hardwood for a few years now, mostly smaller pieces, but am very inspired by your work. I agree with your philosophy on the live edge furniture movement – so much focus on the top or live edge piece(s) with little to no detail put into the base. Would you have any advice for someone younger, more toward the starting side of working with hardwood? Keep up the impressive work and thanks for sharing! Thanks so much for your encouraging comments on my furniture. I enjoyed visiting your website and can see you have a holistic vision for taking projects all the way through from the local tree to the completed piece. This approach must give you a wonderful sense of connection to the land, your community, and the finished product. I also find it very interesting to read and study about the history of furniture and design in general. Right now I am reading a biography about the great French Art Nouveau designer, Emile Galle. It is inspiring and humbling to see the incredibly beautiful things he created. I am always trying to push myself a bit out of my comfort zone and discover new techniques and designs. Of course, I am also trying to make a living making custom furniture and there is a balance one has to find. My actual designs come from drawing. Sometimes I have hazy ideas floating around in my imagination, but usually I have to sketch, doodle, and labor with drafting tools on paper to come up with my designs. I always have a scale drawing ready before I start a new piece. Hope this helps in some small way. God bless. 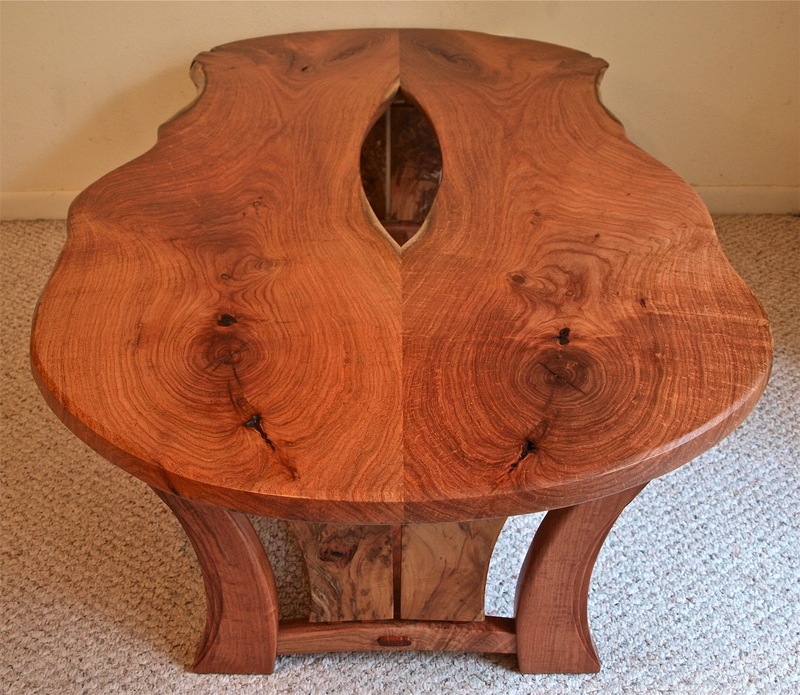 Happened upon your website while scrolling through images to learn the definition of “live edge.” This is new to me and I am so glad I did because your table is beautiful. You are obviously knowledgeable about furniture design and wise enough to allow the natural beauty of the wood to speak in your piece. I particularly like the supporting base in that it is not simply attached as a functional piece but further enhances the organic shape. Lovely to see your respect for the character of the wood. Thanks very much for taking the time to comment & share your thoughts. 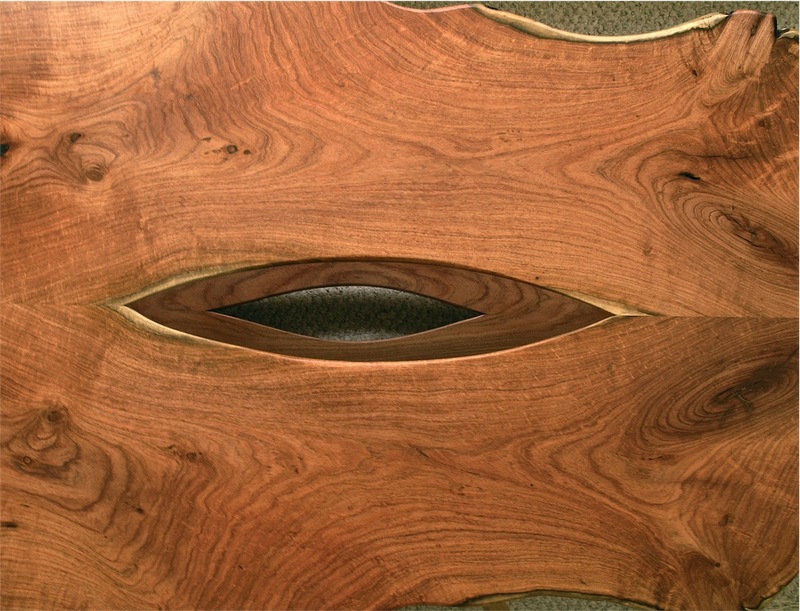 One thing about the live edge phenomenon is that it is a relatively new thing in the history of furniture. George Nakashima made it a part of his design vocabulary in the 1960’s and his daughter maintains a studio that continues to produce his work. 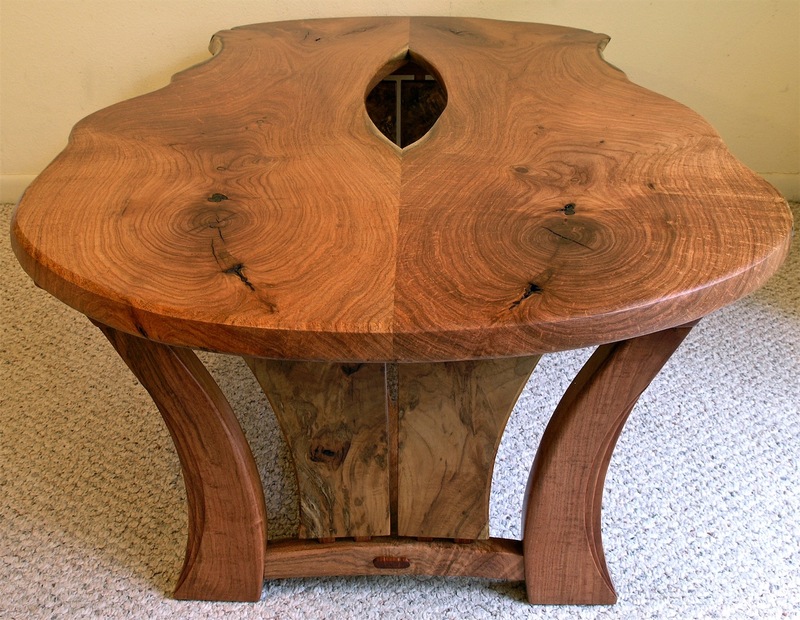 A number of contemporary makers now specialize in creating live edge furniture, but it is certainly not something seen in historic or period pieces. It will be interesting to see where makers take live edge in the future. I certainly have my ideas of what I would like to do, and there does seem to be a responsive public. Again, thanks for commenting. Beautiful design. Where do I obtain your pricing? I love this. The legs are beautiful. Chris, so glad you like the table. I have done a couple of newer tables with legs inspired by this same design.Look for some new posts soon. Thanks very much for your comment. Mr. Fry, Your work is art as much as it furniture. I live about a hundred miles south of you outside of Victoria, Texas. If a person promises no to be to much of a pest would you allow them to come by and visit for a minute or two? Hi Lonnie, You are welcome to come by for a visit. I live out in the country about 25 miles west of Austin. You should make an appointment so I know when you are coming. Feel free to email or call.